Those are the two words that best describe how it felt after the seventh and most illustrious edition of our annual Latino trends and newsmakers event. 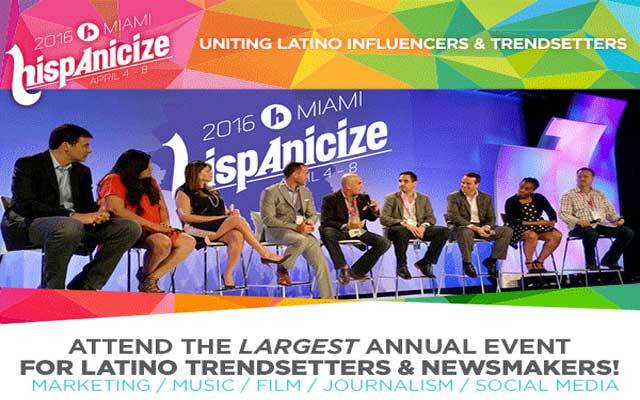 On the one hand, Hispanicize 2016 exceeded all our expectations drawing more than 2,600 attendees to Miami over five days while generating more than two billion combined media and social media impressions. But that’s not the biggest headline. After all the blood, sweat and tears that our team, staff and sponsors poured out to produce this year’s event the most important takeaway I have is this: Hispanicize’s most profound purpose is to unite Latinos. Millennial creators were here, there and everywhere! Pictured here are the beauty and fashion influencers behind La Clika. In hindsight it was almost prophetic for this to be the case because our #PowerInUnity theme matched the partnership focus that made the event so strong. For example, in February the Hispanicize event and DiMe Media teams formally merged to form the new Hispanicize Media Group. Symbolically this signaled the fact this would be the first time that all my partners would be deeply entrenched in executing the event and even though this may not be apparent, this internal unity became the crucial cornerstone of everything we accomplished at Hispanicize 2016. Speaking of partnerships, our unprecedented alliance with NBCUniversal Telemundo Enterprises, Comcast, MSNBC and NBC News was also pivotal to our success. Through this partnership we were able to highlight the stories, issues and influencers that Hispanicize showcased. This alliance underscored why Hispanicize has become the place where major newsmakers gather and where significant decisions and announcements impacting U.S. Latinos take place. As part of our partnership, leading journalists, executives and personalities from the NBC Universal networks participated in important sessions and programs of the event, including the 2nd annual Tecla Awards, three major Latino public affairs town halls, the 3rd annual Positive Impact Awards and more. SBS/La Musica and Coca-Cola had the Hispanicize Music Lounge hopping. On the eve of the event, Hispanicize also completed a major music and entertainment alliance with Spanish Broadcasting Systems (SBS) and its digital streaming and entertainment service LaMusica that was game-changing in its own right and that will lead to an exciting music future for the event. In 2016 the partnership consisted of SBS/LaMusica playing the partner role in the Latino Playlist Music Lounge that every day featured different indie artists. SBS/LaMusica also co-produced a super creative “Celebrity Karaoke” Closing Night Bash with us that featured Fanny Lu, Maffio, Fuego, Fat Joe, Chino y Nacho, Alex Sensation, Justin Quiles and other stars. The future of this alliance is bright and means a lot more F-U-N is coming to Hispanicize in 2017! On the cable side of media alliances our partnership with CNN en Español also provided the event with an ally that massively boosted the national and international visibility of the Positive Impact Awards (PIAs). CNNE provided terrific coverage for the Prudential Financial-sponsored PIAs and also participated at Hispanicize with talent such as Ismael Cala as the co-emcee of the prestigious awards and other personalities speaking in other important journalism sessions of the event. CNN en Español’s top rated show ‘Cala’ with Ismael Cala featured interviews with me, winners of the Positive Impact Awards and Los Pichy Boys. We’re proud of the partnership CNNE brought this year to support Hispanicize and the Positive Impact Awards. Our three-year partnership with the National Association of Hispanic Journalists (NAHJ) also evolved as we jointly launched the first ever national convention for Spanish-speaking journalists within Hispanicize and a first ever NAHJ Student Journalist Project. NAHJ’s leaders and its board are to be commended for the spirit of unity that guided this great collaboration. As the attention turns to the NAHJ’s own national convention, we will be there for them as well. BONDING TIME with Mekhalo Medina, president of the NAHJ. Our first year partnership with Geoscape also took off strong with the co-production of the “New Mainstream” marketing industry showcase that featured case studies, dynamic industry town halls and an unforgettable Gen Z live focus group that was as fun as it was informative. Kudos to Geoscape CEO Cesar Melgoza and Marketing Director Henry Brulay, both of whom were a pleasure to work with. Gen Z speaks at Hispanicize and EVERYBODY listened! 2016 also saw the creation of a three-way alliance between Hispanicize Media Group, BlackTech Week and the Latino Startup Alliance to launch the first ever Diversity Tech Summit. Amazingly the two-day summit was pulled off in one month and is itself an achievement because the line-up of speakers featured real U.S. Hispanic market industry investors, accomplished entrepreneurs like Monster Products CEO Noel Lee and a wonderful Shark Tank-style competition by Wells Fargo called “El Perfect Pitch”. (Special props to Facebook, who with very little notice, became a supporting sponsor of this first year summit). This year’s sponsors took creativity and engagement ideas to new heights starting with Prudential Financial, our 2016 presenting sponsor and easily the new standard bearer for excellence in sponsoring Hispanicize. Prudential Financial’s passionate support for equipping and financially empowering our community was evident with event-wide activations that spanned the DiMe Summit, the Positive Impact Awards, the Latinovator Award lunch with anti-bullying champion Lizzie Velasquez, the Tecla Awards as well as a gorgeous digital lounge on the exhibit floor. Their participation even featured talks with renown DJ MC Lyte as well as welcome remarks from Prudential’s Vice Chairman Mark Grier, one of the most senior brand executives we’ve ever hosted. Prudential Financial’s hashtag, #PruPact, was the second most popular hashtag behind only the event’s main hashtag, #Hispz16 and I don’t think it hurt that they treated most event attendees to some really strategic swag: Prudential selfie sticks! Nice move, #PruPact! Toyota refreshed their official automotive partner presence at Hispanicize with activations that celebrated the 50th anniversary of their flagship Toyota Corolla. I was one of the few people that didn’t physically see the gorgeous gold Corolla people kept riding but nothing kept me from checking out the artistic one that everyone drew on in the exhibit hall. Toyota also played a key role as the official presenting sponsor of the 2nd Annual Tecla Awards, arguably our most visible awards show because it spotlights the work of digital creators. Toyota’s commitment to multicultural content creators is possibly second to none and if you were at the Teclas you would appreciate the incredible work it took for Toyota, Telemundo, Hennessy VSOP, Prudential, Verizon Wireless and our team (Cristy, Katherine, Vanessa and Jessy, among others) to execute. Flama’s Joanna Hausmann won three Tecla Awards, including Creator of the Year. Congrats! Speaking of creative engagements, Carnival Corporation made their Hispanicize debut by becoming one of the lead sponsors of the first annual DiMe Summit and by hosting a dinner at Barton G that, well, really made Carnival shine. Wells Fargo elevated their second year at Hispanicize by launching the national El Perfect Pitch small business, Shark Tank-type competition. The competition culminated on the main stage of the event with a $5,000 grand prize going to In Spirit, a patent-pending product that brings the high-end cocktail experience to everyone by infusing cold-pressed juices and spirits, along with bitters, liquors, and raw sugars, to create mixology-based concoctions. Wells Fargo also earned great reviews for hosting an engaging exhibit space that featured a caricature artist. Best Western also made their second year partnership count. The official hotel partner of Hispanicize activated one of the most useful exhibits in recent memory with a professional portrait studio that commemorated their recent major rebrand and was constantly active daily. Thanks to Best Western (#BWSmiles) several hundred Hispanicizers like me now have portrait shots we can use in our stories and social media profiles. Here’s my own Best Western #BWSmiles portrait. Helps to keep these photos updated! The 2016 version of the Hispanicize Music Lounge was the best one we’ve done yet with DJs, industry chats, an Artist on the Rise stage and even breakdance activations featuring Coca-Cola, SBS/La Musica and Monster Products. Many exhibitors made this year’s space the most dynamic it’s ever been. Honorable mentions include the Home Depot, Unilever’s special His and Her Styling Suite (#CienporcientoTu), Vive Mejor, JetBlue, Kimberly-Clark, Riboli Family Wine Estates and HipLatina, among others. McDonald’s celebrated its popular “All Day Breakfast” theme at its fourth annual Creators Yacht Party. If you don’t know this, our popular yacht party even has a mayor: BuzzFeed’s Adrian Carrasquillo (not pictured here). THE DIME SUMMIT WAS A HIT! One of the biggest risks we took this year, the launch of the first ever DiMe Summit, was a resounding success and a terrific launch to Hispanicize 2016. Held in South Beach’s chic SLS Hotel, the DiMe Summit hosted 200 multicultural digital influencers to an intimate gathering that featured more than a dozen advanced workshops, talks and trainings. Carnival Corporation even gave away a 7-day cruise for two. (Congrats Adriana Martin!). Planning is already underway to make Year Two even more dynamic! For only the second time in our history we integrated hard-hitting discussions about politics and Latino leadership. As part of a major political town hall day we devoted to these topics in partnership with Pinta, Hispanicize was honored to welcome Sol Trujillo as a keynote speaker. The leadership town hall day also featured the Latinovator lunch with Rosario Dawson and panels with Janet Murguia, president of the National Council of La Raza and NBC News anchor Jose Diaz-Balart, among others. Pinta’s Mike Valdes-Fauli and Lauren Cortiñas worked very hard to organize these panels and we are grateful for their efforts. BRAVO! Keynoter Sol Trujillo says Latinos must master a discipline of wealth-building. With wealth comes more clout. I normally don’t participate as a speaker in Hispanicize but this year’s topic of “The Latino Brand in Disarray” was very important. I have much to say about this topic and I will continue to say it until I see our community garner the respect we deserve. Our 2016 class of Latinovator Award recipients were my personal favorite group of all-time. In addition to Lizzie, this year’s group included Vine comedian super star Lele Pons, actress Rosario Dawson (she “feels the Bern”) and Tyler Perry Studios President Ozzie Areu (who will be producing a film with me!). Lele Pons goofs off with me and my daughter Elena at her Latinovator Award moment sponsored by Cricket Wireless. Our best Hispanicize Music Festival line-up to date was highlighted by the performances of YouTube teen music stars Vasquez Sounds and by the closing concert of Reggaeton superstar Wisin. I couldn’t be any prouder of our growing music team that in addition to Katherine Johnson and Vanessa James this year also included top music influencer/director Jessy Terrero. On the film side of the event, Calixto Chinchilla, our director of filmed entertainment, once again stepped up the game with our exclusive film premieres and activations. This year Hispanicize hosted for the first time, a cable television series premiere with the highly anticipated world premiere of “Queen of the South.” The USA Network premiere brought out all the stars from the show including the “Queen” herself, Alice Braga. A fun photo booth on the exhibition floor and a meet and greet with the cast was also featured. Our opening night also showcased the premiere of Unilever’s new “TuTwist” web series with Giselle Blondet. A TuTwist appetizer and drinks tasting was also presented. The screening was followed by a Cricket Wireless After Party at HaVen Lounge that included a performance from La Santa Cecilia. We were also proud to partner with Universal Pictures on its promotion of “The Boss”. A sneak peek of the trailer was presented along with an exciting, interactive video booth which allowed participants to dress-up, boss up and, be a part of a scene from the film. My amigos: Jorge Narvaez of Reality Changers on the left and Lamar Tyler of Black and Married with Kids on the right. The last day of Hispanicize featured a special breakfast preview screening of Disney’s “The Jungle Book” that left all attendees speechless it was so good. It would be a travesty to forget the incredible work that many put into producing daily news video digests, live streaming content and stories onsite at Hispanicize. Shermalee Nicholson and her company Two Ton Beast were simply amazing to work with. If you liked any of our really fun Hispanicize preview sizzle reels, they are the ones who produced them. Shermalee was an important resource to the Hispanicize team months before the event and was also onsite all Hispanicize Week leading our new photo crew as they documented the event. We’re very grateful to continue working with them! Burson Latino’s Studio B and Miami Dade College’s (MDC) School of Entertainment & Design Technology (SEDT) shot, edited and uploaded quality digital content overnight daily from Hispanicize 2016 as well as livestreamed the Second Annual Tecla Awards. I said it to them privately and now I’ll say it publicly: great job guys! On the live blogging front, the NAHJ brought some of their top journalism students to Hispanicize in order to document the event. The quality reporting, photography and social media work these students did tells me they have bright futures ahead. Check out their stories at http://latinoreporter.org/. These lovely ladies were part of the NAHJ Student Project reporting team that documented the event and its influencers daily. Meeting Lizzie! Latinovator Award recipient Lizzie Velasquez, the keynote speaker and award winner that was part of Thursday’s lunch sponsored by Prudential, possibly equaled or bettered last year’s magical Latinovator Award moment with Don Francisco. I always knew the room would be full of tears for her because Lizzie’s story is just that remarkable but what made her moment shine even brighter was when her devoted parents got on stage to speak alongside her. A surge of happiness filled that ballroom at that moment. Lizzie and her family embody everything Hispanicize is about like no one that has come before her or that may come after her. Getting invited to Rome! Another awesome memory was being notified just before Hispanicize 2016 that Pope Francis (yes, THE POPE!) is going to personally host Telemundo executives and myself in Rome in late May to accept the special Innovation Award that Telemundo and Hispanicize gave him at the Tecla Awards. Even though I am not Catholic, it’s a major honor for me to represent our Latino community and our digital creators in giving him this award. (You Hispanicize is going to super document this surreal journey!). BIG THANKS: Manuel Machado and Luis Gonzalez, co-chairs of Ccom Group, helped connect Telemundo and Hispanicize to Pope Francis. They are a big reason why the Pope is greeting us in Rome. All things PIA! Everything about the Positive Impact Awards, including the acceptance speech by Veronica Herrera as the Prudential PIA Person of the Year. Standing alongside Veronica as she passionately and eloquently spoke about serving our community gave me goose bumps. (Veronica, you have the chops to be the next Cesar Chavez!). Seeing my daughter speak! On the last day of Hispanicize I was thrilled to see my 12-year-old daughter Elena speak in the Gen Z Live Focus Group that República sponsored. Just seeing her composure and ability to communicate on stage in front of an audience that included her younger sisters, Angela and I warmed my heart. Meeting Star Wars’ star robot BB-8! As a major Star Wars fan it was a real treat to host “The Force Awakens” robot BB-8. BB-8 made his cameo at the end of a major Disney panel and I just have to say it was delightful to meet him as he posed for photos with his fans. People often give me a lot of credit for the event because I have the big title but make no mistake about it. The incredible success of this year’s event would not have been remotely possible without a constellation of star partners, staff, brand sponsors, agencies, friends, volunteers and vendors coming together to make Hispanicize 2016 great. At the top of my MVP list is my wife and partner Angela. Producing the event takes a huge toll on us and without her help and even my kids’ support I simply can’t imagine this event being what it is. As I said before, this year was the first time all of the Hispanicize partners truly came together to work on the event. I am in awe at the contributions everyone made to executing the event: Lexi Terrero (ran all event operations and financing), Cristy Clavijo-Kish (spearheaded the entire Tecla Awards), Katherine Johnson (oversaw music and assisted with the Tecla Awards) and Piera Jolly (led the DiMe Summit together with DiMe Summit MVP Pam Arana and Angela). In addition to Jay, the other staff member who played a massive role was DiMe Media’s creative director Pam Arana. Pam, your talent, devotion, attention to detail and pride in your work is what makes you very special to us. Thanks for grinding it out. Many others played varying roles in the production of Hispanicize, including the perpetually intergalactic Vanessa James and others. Below is an incomplete list of friends and colleagues (I’m bound to forget someone!) who contributed to making Hispanicize possible: Nic Perkin, Jose Suquet, Joey Suquet, TJ and our entire family group of investors; Jorge Ortega of Burson Marsteller, celebrity stylist and jewelry designer Charlie Lapson (who personally gave me an expert fashion make-over and who this year served as the official creative stylist of the event), Dorinda Walker, Lisa Villarreal, Lamar Tyler, Natalie Boden, Lizette Williams, Maria Cecilia Toro, Patricia Pineda, Luis Rosero, Jorge Plasencia, Luis Casamayor and the República family (happy 10th anniversary! ), Hugo Balta, Alberto Mendoza, the Edelman team, Willy Villarreal, Diandra Escamilla, Malena Higuera, Juan Garcia and the team from Digital Trends, Jose Villa, Jesse Martinez, Felecia Hatcher, Derick Pearson, the entire DaVelle PR team, Brannon Osuba, Marc, Donna, Telia and the entire IMN, Tradeshow Logic and MeetingPlay teams, Sonia Diaz and the Balsera Communications team, Gloria Ordaz, Susana Baker, George “Urban Jibaro” Torres, Jose Resendez, Amanda Taylor, Becky Boricua, Ron Grant, Los Pichy Boys, NAHJ Miami, Veronica Villafañe, Matt Cherry, HPRA Miami, Juan Alanis, Anjelica Cazares, Lizza Monet Morales, Jorge Narvaez, BTL Network, Melissa Gonzalo and the team of Original Impressions. Not even counting our member advisory board it took more than 100 people to produce this year’s Hispanicize event including a great corps of volunteers led by Ingrid Vega. Volunteers, you are too many to mention here but please know that we are very grateful for your work! The presenting sponsor of Hispanicize 2016 and of the Positive Impact Awards s Prudential Financial. The official automotive sponsor and presenting sponsor of the 2nd Annual Tecla Awards is Toyota. The official bank sponsor of Hispanicize 2016 and of the El Perfect Pitch competition was Wells Fargo. For the third year in a row the presenting Food sponsor was Vive Mejor. The official airline is JetBlue. The official trade media partner of the event is iBlog Magazine. Other sponsors included: Amazon, Cricket Wireless, Best Western, Unilever, Carnival Corporation, Facebook, Toyota, Que Rica Vida, Coca-Cola, Verizon Wireless, General Mills, Kimberly-Clark Corporation, Home Depot, Monster Products, Walt Disney Pictures, ViveMejor, Wells Fargo, State Farm, JetBlue Airways, KOA, Hennessy VSOP, Stitch Fix, Riboli Family Wine Estates, Nestle’s La Lechera, Dominican Republic Tourism, Savings.com, JCPenney, Microsoft, Pinterest, USA Network, The Miami Herald Media Company, CNN en Español, Discovery U.S. Hispanic Networks, Diario Las Americas, Fox News Latino, Kelley Blue Book, Fox Audience Strategies, Visit Philly, Burson Latino, StudioB, Alma, República, Synergy Workspaces, Miami Dade College’s School of Entertainment & Design Technology, Sensis, BTL Network, IZEA, Paco Collective, BodenPR, Newlink Americas, Pinta, American Heart Association, the Calvert Foundation, Juan La Iguana, Raydr, the Jackson Health Foundation, the Art Experience and Bright Box. Additional media partners include: The Latino Startup Alliance, BlackTech Week, Voto Latino, Geoscape, Hispanicize Wire, PRODU, El Sentinel, Puerto Rico BloggerCon, Hispanic PR Blog, the Hispanic Public Relations Association, Black Enterprise, Media Moves, iBlog Magazine, SAG-AFTRA, Digital Trends en Español, Social Media Week Miami, PROSPANICA, the National Association of Hispanic Publications (NAHP), Estilos Media Report, HipLatina.com, The Laurita Spina Biﬁda Project, Inc. and Creative Juice Online. 2016 set the bar so high that some of you are telling us it’s going to be difficult to top this year’s Hispanicize. The good news is that we think we can do much better in 2017 because we’ve got plenty of room for improvement and not a few major tricks up our sleeves including major tweaks for Year Two of the DiMe Summit, the Diveristy Tech Summit and our maturing music festival.